Jennifer Okimoto spoke about social business at yesterday’s Canadian Women in Communications (CWC, @cwcafc) meetup in Toronto. Since she’s a friend, former colleague, and all-around awesome person, I just had to catch up with her while she was in town. I was amused to turn up in a couple of her stories. =) Here are my notes from her talk. Click on the image for a larger version. Feel free to share this! (Creative Commons Attribution License) Like these? Check out my other sketches for more. 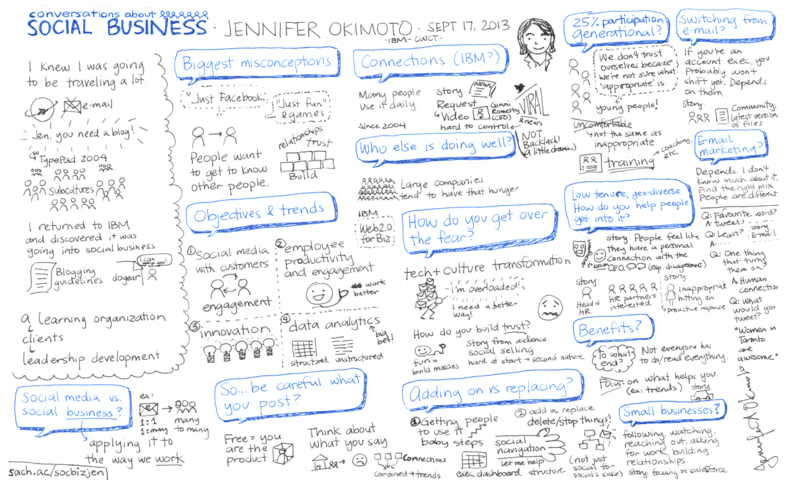 You can find out more about Jennifer Okimoto on Twitter (@jenokimoto) or LinkedIn. For your convenience and ease of sharing, you can find this page at http://sach.ac/socbizjen . Sketchnoter’s notes: I did these sketchnotes on paper because I didn’t have my tablet PC with me. I used a black Pilot V5 Hi-Tecpoint on a legal-sized sheet of paper. It turned out that my flatbed scanner can’t handle legal-sized sheets of paper and my margins were too small for the sheet-fed scanner, so I cut it in half (hooray for plenty of whitespace! ), scanned the pieces, overlaid them in Autodesk Sketchbook Pro, erased the overlap, and desaturated the layer to get rid of the slight greenish cast. I added the blue colour by drawing a separate layer in “Add” mode. Since I drew in ink, I decided to leave the contrast as varying instead of redrawing everything digitally. Drawing on paper makes me miss working digitally (those nice, clean, confident lines!). <laugh> Next time! 2007: I’m going to write a book! 2006: New York, New York! 2005: Programming languages: Quantity? Quality? I think we’re asking the wrong question.